Mechanical engineer Chris Hae Hae has his sights set on a leadership role in the industry – and a Competenz scholarship will help him take the next step in his career. Chris, 33, works as a senior hydraulic service technician and machinist at Summit Hydraulic Solutions in Rotorua, servicing major pulp and paper mills, timber processing plants, power stations and dairy factories all over the Bay of Plenty. As well as fault finding out on jobs, he offers preventative advice to customers and carries out sales orientated work. After a stint working in forestry, Chris joined Summit Hydraulic Solutions in 2005 and completed his apprenticeship in mechanical engineering in 2015. 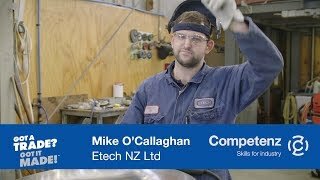 This year he was one of 69 former apprentices from around New Zealand who applied for Competenz scholarships, awarded to ambitious workers to help fund higher level learning and skill development. He will use the scholarship to complete a New Zealand Certificate in Mechanical Engineering (Level 5). As a father of three children aged nine, seven and four, and a big extended family, Chris says he wants to lead by example and show young people that a career in engineering and other trades can lead to success. Chris aims to keep building on his skills and knowledge with a view to one day taking on a management or leadership role in the industry. Competenz chief executive Fiona Kingsford said the scholarships were an ideal opportunity for learners to upskill and develop their careers into management, sales or team leader roles. Photo: Chris Hae Hae and Summit Hydraulic Solutions Managing Director Chris Joseph.